AshleyNewell.me: HHH: Right Back in the Box! HHH: Right Back in the Box! So, that darn box has pulled me back in. Well, I'll admit that I already had the image colored so that was a deciding factor in what I was going to do with this card. However, I should say that it's not a permanent move back into the comfortable little stamping box. This card was made using the Wednesday Sketch challenge on SCS. The image is from Unity's May KOTM. I colored it and then added Stickles to the centers of the flowers. The designer paper is Amy Butler, I love Amy Butler! And then of course, in true Ashley fashion, there's bling. Happy Hip Hop Hangover Day everyone! There's nothing wrong with "the box"! This is beautiful! This is so pretty :) And happy! This is just to cute. love it... love those papers too! Very pretty dp! Great card! I love that tree and all the bling! Glad to see your visiting that "box" again. It's so hard to get going those first few months... heck! that first year! LOL! Great card! I love how you used the paper. Great card. Oh my word I love this box that colors awsome!!! you work awsome! Ashley, this card is fabulous! And I peek'd at your Hydrangea card below...fantastic! Ashley, this is really neat! LOVE that paper! Bling and pink. What's not to like? I'm so glad you're back. 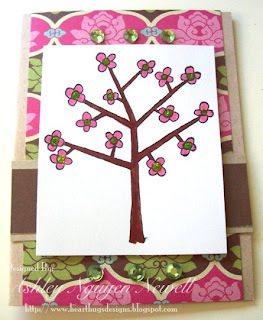 gorgeous card....love that little unity tree! Awesome card. I love Amy Butler too. Your kids are adorable! And your cards are perfect whether in or out of the box! !